Harrow School is one of the oldest and most famous schools in England, educating over 800 boys, all of whom are full boarders. There are many famous alumni, of whom Winston Churchill is probably the best known. The Byron Consort is Harrow’s elite vocal ensemble and was founded in 2001 by Philip Evans, who continues to direct the choir. It consists of around twenty Harrow boys and four or five adults. The choir sings a mixture of unaccompanied sacred and secular music, most of which comes from the Renaissance, Romantic and Modern periods. 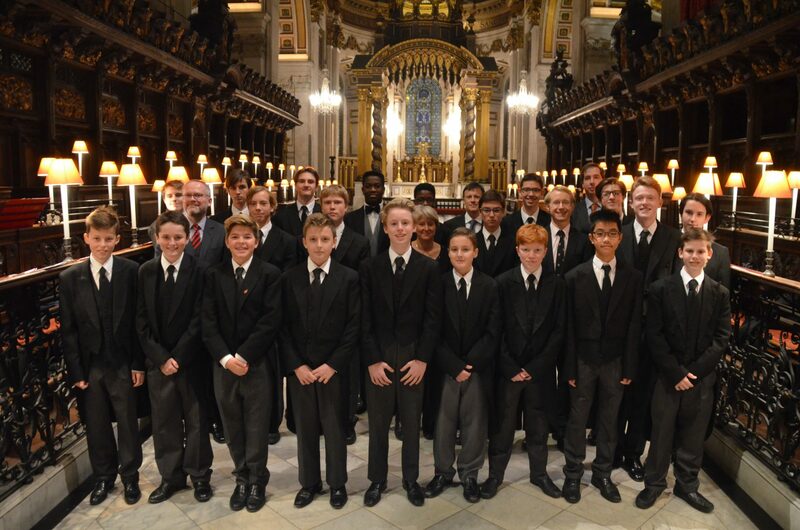 Many of the boys are ex‐choristers from leading cathedral and collegiate choirs – there have recently been representatives from the choirs of Westminster Abbey, King’s and St John’s Colleges Cambridge, Canterbury, Westminster and Winchester Cathedrals, St. George’s Chapel Windsor and Christ Church Cathedral Oxford – many of the boys are Music Award Holders at Harrow School. Since its inception the choir, has sung regularly at services and concerts at Harrow and at St Paul’s Cathedral, Westminster Abbey, Westminster, Winchester, Salisbury, Canterbury and Chichester Cathedrals, St George’s Chapel Windsor Castle, various college Chapels in Oxford and Cambridge and many other London churches. A few years ago, the choir sang for the former British Prime Minister David Cameron, the late Duke of Marlborough and their guests at a Christmas dinner at Blenheim Palace. The choir has now been on seventeen overseas trips: to Malta and Gozo, Rome (three times), Venice (twice), Florence, Palermo in Sicily, Vienna & Salzburg, Stockholm, Washington & New York, Moscow & St Petersburg (twice), Cape Town & Nairobi, Toronto & Chicago and Norway. Many notable venues include St Peter’s Basilica in Rome, St Mark’s Basilica in Venice, the Duomo in Florence, St Basil’s Cathedral in Moscow and Trinity Wall Street & St John the Divine Cathedral in New York City. In 2014, the choir visited North America for the second time. In Toronto, they sang in the Chapel of Trinity College, St Paul’s Basilica and St James’s Cathedral as well as at St Mark’s Church in Niagara on the Lake. In Chicago, they sang in the Church of the Atonement, the Rockefeller Chapel of the University of Chicago and the Roman Catholic church of St John Cantius. The choir visited Milan and Turin in February 2015, during which it sang in the Duomo and in Sant’Ambrogio in Milan, amongst many other sacred venues. In December 2015 the choir travelled to Singapore, Hong Kong and Shanghai, during which it gave concerts to over 1000 people on two occasions and sang at many notable venues including Raffles Hotel in Singapore. In 2016, the choir commissioned new settings of the texts O salutaris hostia and Tantum ergo from the leading British composer Gabriel Jackson and gave the world premiere performances of them in Harrow School Chapel on Palm Sunday in the presence of the composer. The choir’s most recent overseas tours were in April and December 2017. In April, there was a series of performances in South Africa and Kenya, singing in St George’s Cathedral in Cape Town and at the residence of the British High Commissioner in Nairobi amongst a number of other venues. In December, the choir travelled to Norway for its seventeenth overseas tour, during which performances were given in Bergen, Fitjar, Tromsø, Lillehammer and Oslo. The choir will travel once again to Moscow in February 2019.